Whitman Sackett Mead, a life long and highly respected citizen of the town passed away in his home on Maple avenue on Monday evening, following an attack of acute indigestion, from which he had been suffering for the past two weeks. He was sitting in his chair, when stricken with heart failure and died before medic an aid could be administered. 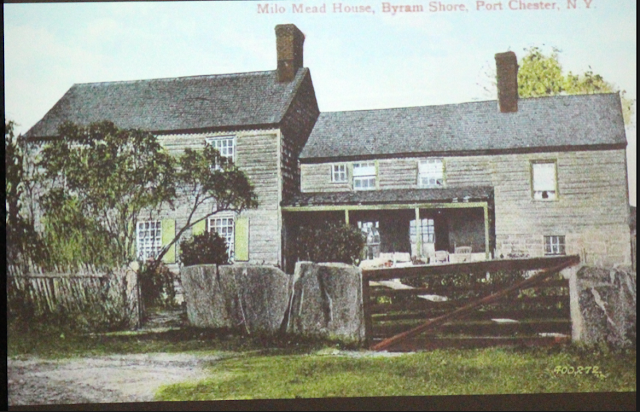 Mr. Mead was born in the old Milo Mead homestead in East Port Chester, the son of Mr. and Mrs. Charles Mead on April 17, 1841, but the greater part of his life was spent on Mead Point. He was a descendant of one of the oldest and most distinguished families of the place. His early education was received at the district school in Cos Cob, but later he entered Greenwich Academy, first under the principalship of Mr. Treat and later of Philander Button. At the age of eighteen he became clerk in a wholesale house in New York city, but did not remain there very long, owing to the fact that every member of the firm, which consisted of Southern men, dissolved partnership, when the war between the north and the south broke out. Upon his return to Greenwich, Mr. Mead assisted his father in the farming business and soon became manager of the entire estate. Like his father before him, he was a staunch Republican. He cast his first vote for Abraham Lincoln in 1860 and since that time has been a loyal supporter to the party. He served as a Selectman, registrar of voters and in the year 1897 was elected to the office of Judge of Probate. He held the office of County Commissioner from July 1st, 1897 until last fall, when Governor Baldwin appointed Dennis Mulvihill, of Bridgeport to be his successor. After a contest in the Supreme Court Mr. Mulvihill received the appointment and took office a week ago. This is the longest period period that County Commissioner has ever held office. He was one of the organizers and a trustee of the Greenwich Trust Company and a director of the Mianus Manufacturing Company. 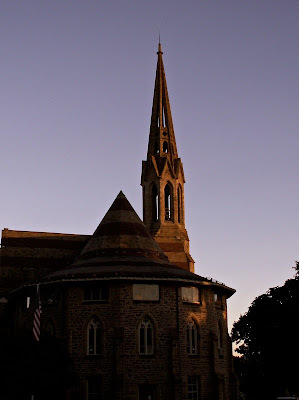 Mr. Mead was one of the oldest members of the Second Congregational church and held many important offices in the church during the past thirty years. On February 9th, 1871, he married Sarah Mead Sackett, the daughter of the late J. Ralph and Mary E. Mead Sackett, then well known residents of Greenwich. He made his home in the old homestead at Mead's Point, which was purchased by his ancestors in 1636. For more than two centuries, Mr. Mead's ancestors have been identified with the town and several members of an earlier generation fought in the Revolutionary war. It is understood that he was the eighth Mead in the community in which he lived. His sudden death came as a great shock to his many relatives and friends in this town and elsewhere. He was a devoted husband, a kind father and a true citizen. Besides his wife, he is survived by three daughters, Miss Julia B. Mead, Mrs. Frank V. Reynolds, and Miss Marian Mead, also a sister, Miss Hannah Mead, and a brother, Charles N. Mead. The funeral service will be held from the Second Congregational church tomorrow at 2:30 p.m. The internment will be in the family plot in the Congregational cemetery. Source: Greenwich Press. Friday, April 25, 1913. Page 4. 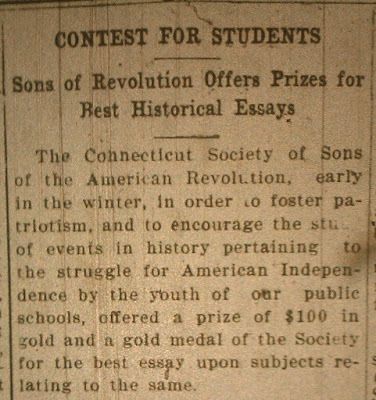 The Connecticut Society of Sons of the American Revolution, early in the winter, in order to foster patriotism, and to encourage the study of events in history pertaining to the struggle for American Independence by the youth of our public schools, offered a prize of $100 in gold and a gold medal of the Society for the best essay upon subjects relating to the same. The scholars of the five public schools in Greenwich mentioned below, are offered local prizes for the best esssay on the subject, and the winners of the local prices are eligible for the state prize. 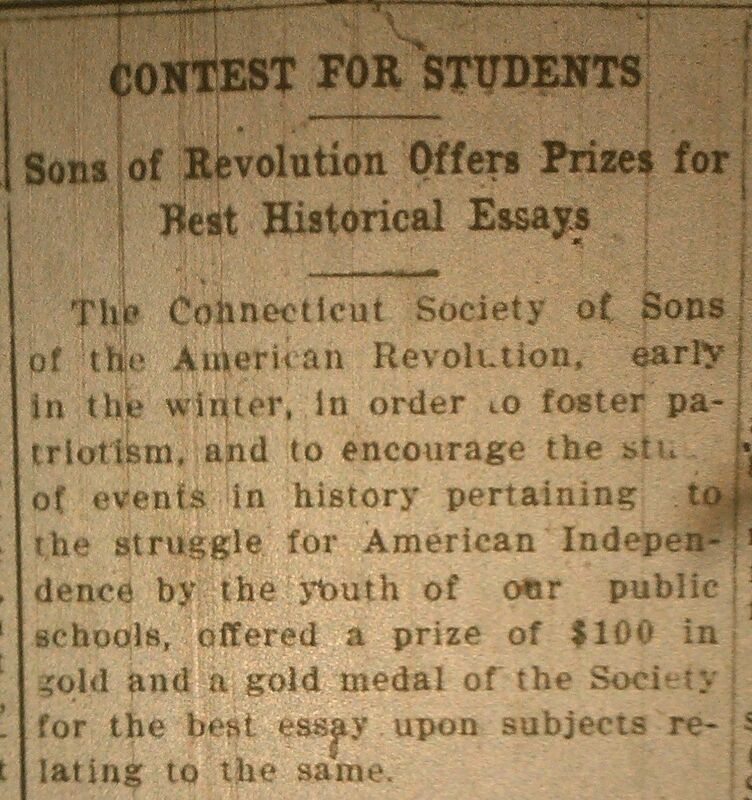 The local prizes to consist of a $5 gold coin and a silver medal of the Society. (a) Original research involved and its preparation. (b) General treatment of the subject matter. (c) Literary merit in composition. The competing essays must be delivered to the committee to judge of its merits by May 15th. The winner of the state prize will be announced on June 4th, the anniversary of "Connecticut's Declaration of Independence," and the day of the annual meeting of the State Society. New Lebanon school-Charles E. Chapin.